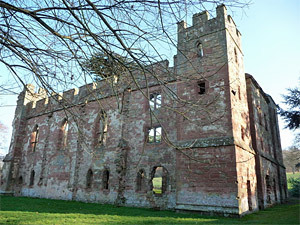 Red sandstone ruins of a fortified 13th-c manor house located in the grounds of an 18th-c country house. 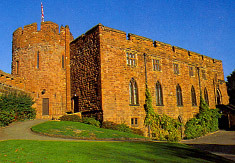 Originally owned by Bishop Robert Burnell. Despite its crenellations, the internal layout is more in keeping with a manor house than a castle. Parliament is said to have met here in 1283. A classical-style mansion built in 1785 for the 1st Lord Berwick. One of England's finest regency houses, set in a landscaped deer park - designed by Humphry Repton. Run by the National Trust. The estate also hosts Home Farm - an organic farm open to the public. Opening times: House: Mar~Oct, Fri-Tues 1am to 5pm, Deer park and Grounds open daily 9am to 6pm. Facilities: parking, café, shop, tea-room, guided tours available. An attractive late Elizabethan stone	house with mullioned windows, located near the Severn Gorge. Inside it has fine oak panelling and a magnificent carved staircase. Originally a timber-framed farmhouse, it was upgraded to a hunting lodge in the 17th century. 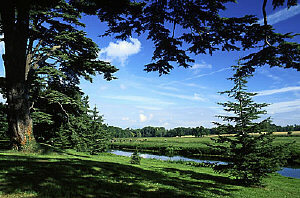 Charles II is said to have hidden from Parliamentary troops in a nearby oak tree during the civil war. Run by English Heritage. A ruined Norman castle built in 1101 by Robert de Belleme. The keep now leans at 17° from the perpendicular (three times greater than the leaning tower of Pisa), due to attempts to blow it up during the Civil War. Opening times: check Website for details. Extensive ruins still exist of this 12th century Cistercian abbey, surrounded by woodlands beside the River Severn. Opening times: Apr~May &Sep, Thu-Mon, 10am to 5pm; Jun~Aug, daily, 10am to 6pm. Georgian mansion set within 15 acres of riverside gardens, housing the National Clematis Collection. 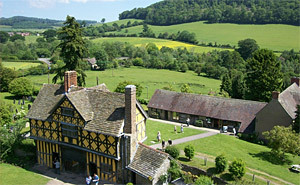 Facilities: parking, shop, restaurant, garden centre. 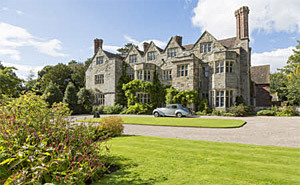 Late 17th century house, surrounded by extensive gardens and parkland with lakeside walks. The house contains both contemporary and modern works, botanical art and fine furniture. Run by National Trust. Ruins of an abbey founded at the beginning of the 12th century by the Augustinians. Includes a small museum. Managed by English Heritage. A vast landscape (60 acres) of flower borders, tall trees, sweeping lawns, plus a series of ornamental pools that run along the garden valley to provide a habitat for birds and wildlife. A clean, friendly family orientated farm with a wide variety of domestic animals from lambs to llamas, deer and ostriches. Daily feeding of lambs and pigs. Indoor and outdoor play areas and games room. 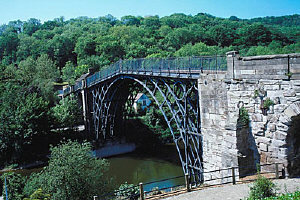 The Iron Bridge at Ironbridge, was the first iron bridge constructed in England, between 1777 and 1779. The bridge is now a Grade 1 listed ancient monument and the surrounding site contains a series of a remarkable museums relating to the story of the bridge and life in Victorian times. Facilities: parking, shop, café, restaurant. The ruins of a house founded	in 1148 for Arroasian canons. Built by Roger de lacy, a Norman knight, circa 1090. 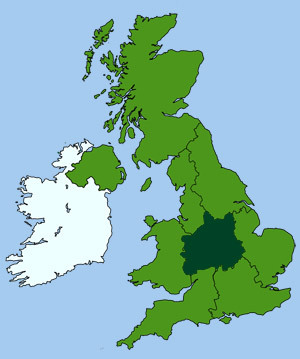 It was once the principal defensive castle on the Welsh Marches. A castle has been standing on this site for nearly 1000 years. 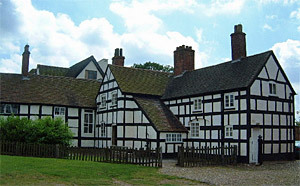 It was partially rebuilt as Elizabethan mansion House in the 16th century. Extensive Iron Age hill-fort covering some 68 acres, surrounded by a series of ramparts. Managed by English Heritage. One of the largest air force collections in the UK with over 70 aircraft, including Vulcan and Victor bombers, the Hastings, British Airways airliners, the Belfast freighter, TSR2, Fairey Delta, Bristol 188 and many others. Facilities: parking (charge), shop, restaurant. A series of interactive displays explore the nature, geography and history of the Shropshire Hills. The site contains over 23 acres of gently sloping meadow lands alongside the River Severn, which can be explored by foot or by cycle. A fortified manor house dating from the 12th century, surrounded by a moat and delightful cottage gardens. A Typical Victorian villa, built for prosperous professional people living in the suburbs of towns and cities. Once home to the Lander family, the house is a time capsule of early 20th century life, above and below stairs. Managed by National Trust. The ruins of a large Cluniac priory with a 13th century church and Norman chapter house. Managed by English Heritage. Ruins of a 12th century Augustinian nunnery, that was destroyed during the Civil War. Managed by English Heritage. These are the remains of Viroconium, the fourth largest city of Roman Britain. 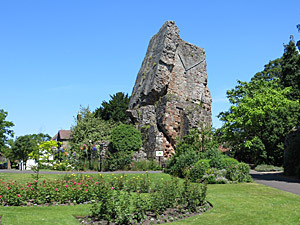 Visitors can view the remains of Roman villas, houses and a 2nd century municipal baths. The on site museum displays treasures and artifacts excavated at the site. Managed by English Heritage.